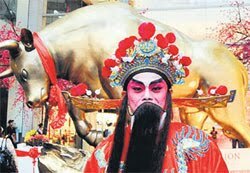 TOMORROW, Chinese around the world, including Malaysian Chinese, will herald in the Year of the Ox. Chinese New Year is the most important festival that the Chinese celebrate and it is steeped in tradition. It is also called the Lunar New Year because the Chinese calendar is calculated according to the positions of the moon. A leap year occurs every three years with the addition of a 13th month. That is why it begins on a different day each year, but it is always on the first day of the first moon (month). This festival is rich with legend and ritual. The Chinese New Year first came about when, once upon a time, there was this huge and hungry animal called Nian or "Year" in Chinese, which would prowl the villages of Shanghai on winter evenings in search of human prey. Nobody knew how to escape from it. One day, by luck, someone hung a piece of red cloth on a tree. When Nian came and saw the red cloth, it was terrified and fled. Another version is that the villagers painted the whole village red. When Nian came, firecrackers (at that time explosives were put into hollow bamboo) were exploded amid the beating of gongs. This explosive commotion finally scared Nian away and the villagers never saw Nian again. That is why red is the most prominent colour during the New Year celebrations. It symbolises good luck and it wards off evil spirits like Nian. In earlier years, firecrackers were let off throughout the celebration. The other reason being, that the more you spent on firecrackers, the more wealth you would accumulate for the new year. That probably explains why it is so difficult to enforce the ban on firecrackers in Chinese-populated areas in the country. Next came the legend of Buddha and the 12 animals that bothered to answer his call to his deathbed. He rewarded them by naming a year after each of them, in order of their arrival -- the rat, ox, tiger, rabbit, dragon, snake, horse, sheep, monkey, rooster, dog and lastly the pig. Hence the Chinese are identified by these animal signs, and they believe the sign under which they were born influences their lives. So the saying, "you possess the characteristics of this animal that hides in your heart". Preparations would always begin somewhere on the 20th day of the 12th moon (or the last month of the old year) when house cleaning begins and supplies made to last until the celebrations end on the 15th day of the first moon, also known as the "big year" (da nian) or Chap Goh Meh. On the 23rd day of the 12th moon, the entire house must be cleaned and scrubbed until it is spick and span, especially the hearth because it is the seat of the Kitchen God -- Zao Jun. I remember the annual house-cleaning was always full of fun for us when we were little because we got to play with water hoses and soap as we scrubbed the wooden walls of our old attap house in Yong Peng. Like many other Chinese gods, Zao Jun was a human being who had been deified. It was said that when Zao Jun was a mortal, he had been a good and kind man. But he had to give his wife to someone else in marriage because he was too poor to keep her. One day, while out begging, he came to the house where the old wife lived. When he saw her, he was so ashamed that he ran to hide himself in the kitchen hearth and died in that fiery place. Then the Jade Emperor in Heaven made him the god of the kitchen because he was an honest and good man. Every year on this day, this culinary god would return to the Imperial Palace in Heaven to report to the Jade Emperor on the year's events, especially the state of the family. For this purpose, a special meal full of sweet things would be prepared for him before he made his heavenly journey so that his lips would be honeyed when he made the report. And if he ate the sticky cake (nian gao) made of glutinous rice steamed in brown sugar, then his mouth would be stuck on it and his lips sealed so that he could only nod his head to show that the family had been good. To speed up his celestial journey, firecrackers are set off that night. They are also exploded to scare away demons and spirits of the past year. The 30th day of the 12th moon, and that is today, is the New Year's Eve. It is also the day the Kitchen God returns from heaven. A traditional reunion dinner, usually with no fewer than 10 courses, is a must for every family. It is always held at the home of the most senior male member of the family, and attended by all generations when young and old return from afar to be reunited around the dining table. As for me, this day is of particular poignancy. For the last few years now, whenever I sit down for the reunion dinner, I cannot help but pine for my dear father's presence at the table, missing since May 2000. He was such a good cook, and was always the one to cook a sumptuous Foochow dinner for all of us. Celebrating this festival with him had always been a joy as well as an education because he would follow the traditions strictly. Apart from nian gao, there are a few other food items which are most noticeable during this celebration and consumption of which will bring in wealth and good fortune. They are fish, mandarin oranges, groundnuts, melon seeds or guazi and Chinese vermicelli or mee suah. Fish symbolises abundance as the Chinese phrase goes, nian nian you yu or "there will be fish or surpluses every year". Here, I must specially thank my clients, the 8,000-member Fishermen's Association of Johor and its president, Mohamad Dolmat, who have been so thoughtful all these years in sending me boxes of very fresh fish representing their best catch of the day for my New Year's Eve reunion dinner. Mandarin oranges are the most popular fruit for this celebration. Called kam in Cantonese, it also sounds like gold. Like groundnuts, they will bring a fortune of gold and prosperity if consumed. Taking melon seeds will also make a married couple fruitful according to this Chinese saying, kai hua jie guo or "will bloom and become fruitful". Uncut mee suah will, of course, bring longevity. Before midnight, married persons will give each child an ang pow or lucky money in a red packet with golden lettering on it. It is believed that when one gives an ang pow, he is guaranteed another year of life. Likewise, before midnight, all outstanding debts must be repaid and any quarrels with neighbours or friends must be settled; otherwise all the bad luck would be brought into the new year. Some also believe that fingernails and toenails cut on this day of the year will get rid of all ailments. Houses remain lighted until morning. Doors and windows are locked and sealed with red paper to prepare for the ceremony called "Opening the Gate of Fortune" (Kai Cai Men) on the morning of New Year's Day. When cockerels crow, the master of the home would unlock the doors and remove the seals after uttering a few words of good omen for prosperity. Fragrant incense and joss sticks are burnt and the master takes three bows before the heavenly sky, and the Kitchen God who has returned overnight is also entitled to three such bows. One tradition which my father left behind, and which we still follow, is to take this drink before breakfast on New Year's Day -- a drink mixed with groundnuts and rock sugar so that our lips will be sweetened and continue to have good manners throughout the new year. The floor must not be swept on New Year's Day; otherwise all the good luck of the new year is swept away. Married daughters will only visit their parents on the second day. Dog-lovers will love this day as it is also a birthday for all dogs. It is not advisable to visit any relatives and friends on the third and fourth days lest their relationship be fraught with arguments later on. The fifth day is also the birthday of the God of Prosperity or Cai Shen whose return to earth on this day will be welcomed with firecrackers. For the Hokkiens, the ninth day is even more important than the first day, and they will pray to the Jade Emperor with offerings of sugar cane. It was said that during the Ming Dynasty, the Hokkiens hid in sugar cane fields to escape from their enemies. When they emerged from the fields, it was also the ninth day of the new year and the only thing they could offer to the Jade Emperor in thanksgiving was sugar cane. The celebrations continue until the 15th day of the first moon. The first full moon of the lunar new year appears on this day. Colourful lanterns are displayed, and the dragon and its guardians, the lions, dance to the tune of the gongs and cymbals. It was said in ancient times that this was the only day the Jade Emperor would watch his earthly subjects from his heavenly throne. So, it was necessary for the lanterns to light up the happy faces of men, women and children as he watched with a contented smile on his face. Hence this day is sometimes known as the Lantern Festival. It is also a night when damsels would throw oranges into a river from the top of a bridge in the hope that the God of Love would get each of them a good husband in the coming year. Today, many of the mentioned customs, which are more associated with those who believe in Taoism, may no longer be in practice. But it is still one festival which is celebrated by all Chinese regardless of their educational background or religion. As Malaysians, we have much to give thanks for because we can celebrate various festivals in peace and harmony. This is also an important occasion in which all other races will come together to celebrate with their Chinese friends in the true spirit of muhibbah. This article was published in the New Sunday Times on 25 January 2009.